Buddhism, like many forms of “spirituality,” tends to be divorced from the needs for collective social transformation. 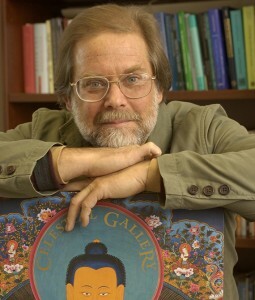 As Buddhism interacts with democratic societies, there is an opportunity for an integration of personal and public via the traditional technologies of “waking up.” David argues that there is an important parallel between what Buddhism says about our personal predicament and our collective predicament today in relation to the rest of the biosphere. A PDF Poster may be downloaded here: David Loy Poster. David Robert Loy is a professor, writer, and Zen teacher in the Sanbo Kyodan tradition of Japanese Zen Buddhism. He is a prolific author, whose essays and books have been translated into many languages. His articles appear regularly in the pages of major journals such as Tikkun and Buddhist magazines including Tricycle, Turning Wheel, Shambhala Sun and Buddhadharma. David lectures nationally and internationally on various topics, focusing primarily on the encounter between Buddhism and modernity: what each can learn from the other. He is especially concerned about social and ecological issues.